His story is a great example of parents that let their child pursue his curiosity, even if it meant not caring about whether or not he went to school. “Effective negative equity” is central to my “structurally broken housing market in need of years of de-leveraging before a “durable” bottom can occur”, theme. I have been pounding the table over “Effective” negative equity for years and finally it’s mainstream. Chances are this one report will be blown over. But like with ”shadow inventory” — when this thesis grabs hold — ultimately everybody will be talking about it, it will raise uncertainty, and economists will have no choice to respect the “math”. And the math requires housing sector estimates have to be ratcheted down. This literally changes everything with respect to housing ‘demand and ‘supply’ fundamentals. The Zillow report confirms there is still a ton of de-leveraging to do before US housing has a shot at a “durable” recovery. Remember, in the past everybody could always sell and rebuy all of the time. Equity — or a lack of it – was rarely a problem because before the housing bubble loans required down payments. And during the bubble no down payments were needed. Moreover, house prices always rose during these periods. What created “zombies” prior to the housing crash was employment, income, and rates. But now it’s all about the equity. And with such a large percentage of homeowners in a negative and/or “effective” negative equity position housings’ “Maximum Potential Demand” profile is much weaker than it ever has been before. Housing is going through a demand spurt no doubt. The smart money was the institutions who began to buy two and three years ago. On Twist — and a plethora of media coverage on Wall St buying bulk housing pools and participating in County courthouse foreclosure actions at year-end 2011 – everybody become a distressed house flipper or rental professional. Towards the end of last year all the hoopla and press coverage activated the “dumb money” — which includes pent-up demand — which are ”retail” who are pouncing early this year and chasing the market into summer. But the numbers are not there…repeats can’t support this market. April Existing and New Home Sales and the Zillow data prove it. This market needs investors and first timers, like it had from 2010-2011. But now. First-timer volume hit a fresh 4-year lows last month and distressed resales 6-year lows. It’s a sad state of affairs when rates are at historic lows and First-Time buyer demand is at post-crisis lows. I think there is a good chance the housing market is about to experience mid-year volatility never seen before mostly propagated by malinvestment from P/E funds using cheap money to buy up all the distressed housing and turn them into rentals. There is no ”housing shortage” problem in the country with respect to “places to live”. When including SF construction, MF construction, lack of demolition, the past 5 years of foreclosures of vacant house, rentals and 2nd houses, and lackluster household formation I argue there is plenty of houses out there in which to live. There is simply a transitory dislocation with respect to houses in the “for sale” bucket. Builders are being opportunistic and capitalizing on this right now. But if I am right and the ”housing shortage” problem is only a allocation mirage then forward estimates are wildly aggressive. And obviously, if this is still a free market and demand is strong enough this supply will find a way to market. Bottom line on the Zombie housing market: Of the 54 million homeowners with mortgages — the primary repeat buyer cohort and a primary builder demand cohort – over 22 million are dead to the housing market. Of the 70 million SF homeowners — mortgage’d and free and clear — 33 million are Zombies. Thus, we can’t expect housing to act like it has in the past. With so many Zombies it will be impossible for repeat and new home sales to perform as expected. The past 18 month bounce — especially on prices — has been on cheap and easy money from investors looking for a dividend stock and/or Treasury replacement trade. some foreigners following their lead, and finally the ‘dumb money’ (retail) chasing into this summer. But we are running out of greater fools very quickly, especially with first-timers sidelined and new-era “investors” who are quickly pricing themselves out of markets nationwide. I'll try and do a complete and updated post when it gets closer to July 1st, but until then, I'll update this post when new possibilities get passed along to me. Every year (sometimes twice), longtime tech analyst turned venture capitalist Mary Meeker drops her state of the internet presentation. It’s that time of year again, and here it is. I don’t agree with everything in this article. While I do agree that the nature part of ‘nature + nurture’ does need some minimum level, I think nurture is much more important than I think this article implies, and am more in line with most of what Gladwell has said. Gladwell’s definition of talent, from an interview he gave a few years ago, is: “Talent is the desire to practice. Right? It is that you love something so much that you are willing to make an enormous sacrifice and an enormous commitment to that, whatever it is -- task, game, sport, what have you.” I think achieving expertise is an extremely difficult thing to do, which is why it is so rare, but it is that love that leads to the drive to make the sacrifices needed to ‘practice’ deeply to achieve expertise that is what is important. And, in my opinion, that love and drive is triggered more by one’s environment, upbringing, and luck than it is by anything one is originally born and wired with. In particular, the 10,000-hour rule seems to have captured the public imagination. New Yorker writer Malcolm Gladwell didn’t invent the rule, but he did popularize it through his best-selling book Outliers. The principle actually dates to a 1993 study, though in that paper the authors called it the 10-year rule. Whatever name it goes under, the rule essentially says that in order to become an expert in any field, you need to work for at least x amount of time. I don’t know what all the fuss was about. But I guess a big round number brings the equation to life or makes a formula for success sound scientific in a way that simply saying “Practice, practice, practice” doesn’t. Still, that interpretation of the rule seems reasonable to me. Talent plus ten thousand hours of work equals success? Talent plus ten years of work equals success? Sure! But that’s not how the rule often gets interpreted. Consider this article about the 10,000-hour rule that opens with the example of Warren Buffett, one of the wealthiest people in the world: “As Buffett told Fortune not long ago, he was ‘wired at birth to allocate capital.’ … Well, folks, it’s not so simple. For one thing, you do not possess a natural gift for a certain job, because targeted natural gifts don’t exist. (Sorry, Warren. )” Maybe the issue here was the word targeted. Was Warren Buffett born to be a CEO specifically? Was he born to run a behemoth corporation like Berkshire Hathaway rather than, say, to work as a day trader? No. But was he born with a brain for business — a brain that would lend itself to number-crunching and risk-taking and opportunity-identifying and all the other skills that go into becoming the leading investor of his generation? I say yes. Certainly Buffett put in his ten thousand hours or ten years of work. He bought his first shares of stock at the age of eleven, founded a successful pinball-machine business with a friend at the age of fifteen, and before he graduated high school, he was wealthy enough to buy a farm. This is not the career trajectory of someone who’s interested in business and is putting in his ten thousand hours. This is the career trajectory of someone who lives to do business. You might say it’s the path of someone who was born to do business. You might even say it’s the path of someone who was wired for business at birth. By putting such an emphasis on practice, practice, practice at the expense of natural gifts, the popular interpretation of the 10,000-hour rule does a tremendous disservice to the naturally gifted. Via Max at Future Blind (who edited the best compilation of Warren Buffett’s letters you can get, HERE). Below is the letter that Warren Buffett wrote to Katherine Graham in June 1973 after he had acquired over 5% of the stock. By the end of the year his stake had increased to 10%. The letter gives a lot of insight into how Buffett viewed the Post—not only as an investment, but as a business with noble purposes that brings out his sentimental side. Regular readers are familiar by now with Horizon Kinetics’ focus on qualitative attributes that may be predictive of outperformance. Consistent with the Firm’s long-term value investing philosophy, identification of these traits has been central to our research and investing process since the inception of the Firm. Fundamental research is generally required to identify these characteristics. This is a time-intensive process, which contrasts with the quantitative screens that can be used to identify groups of stocks with similar price to earnings ratios or sector classifications. However, the long-term performance of companies described by these predictive attributes suggests that the effort is worthwhile. Recent commentaries have highlighted owner-operators, dormant assets, spin-offs, bits & pieces, and scalability. This month’s discussion will center around long product lifecycles. I do not understand why any buyer of a business looks at a bunch of projections put together by a seller or his agent. You can almost say that it's naive to think that those projections have any utility whatsoever. We're just not interested. If we don't have some idea ourselves of what the future is, to sit there and listen to some other guy who's trying to sell us the business or get a commission on it tell us what the future's going to be—like I say, it's very naive. While in Australia to lobby for increased foreign aid commitments, the world's richest man, Bill Gates, joins us to talk about philanthropy, taxing the rich, Steve Jobs, and his belief in a God, in this extended version of the interview that originally aired on 7.30 on Tuesday 28 May, 2013. The U.S. stock market escaped the selloff in the Japanese market—at least for now. When the Nikkei Stock Average dropped 7.3% this Thursday, the Standard & Poor's 500-stock index fell by as much as 1.1% during the day, only to finish down a hair. But the plunge in Japan, triggered partly by fears that interest rates might rise, is a wake-up call for U.S. investors. 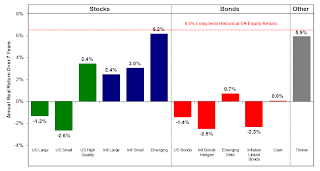 It is worth peering inside your portfolio to evaluate which assets could be most vulnerable once the Federal Reserve finally stops keeping interest rates unnaturally low. “Trial and error has one overriding value people fail to understand: it is not really random, rather, thanks to optionality, it requires some rationality. One needs to be intelligent in recognizing the favorable outcome and knowing what to discard. I wrote several years ago that Japan is a bug in search of a windshield. And in January I wrote that 2013 is the Year of the Windshield. The recent volatility in Japanese markets is breathtaking but characteristic of what one should come to expect from a country that is on the brink of fiscal and economic disaster. I don't mean to be trite, from a global perspective; Japan is not Greece: Japan is the third-largest economy in the world. Its biggest banks are on a par with those of the US. It is a global power in trade and trade finance. Its currency has reserve status. It has two of the world’s six largest corporations and 71 of the largest 500, surpassed only by the US and comfortably ahead of China, with 46. Even with the rest of Asia's big companies combined with China's, the total barely surpasses Japan's (CNN). In short, when Japan embarks on a very risky fiscal and monetary strategy, it delivers a serious impact on the rest of the world. And doubly so because global growth is now driven by Asia. Japan has fired the first real shot in what future historians will record as the most significant global currency war since the 1930s and the first in a world dominated by true fiat money. At the risk of glossing over details, I am going to try and summarize the problems of Japan in a single letter. First, a summary of the summary: Japan has painted itself into the mother all corners. There will be no clean or easy exit. There is going to be massive economic pain as they the Japanese try and find a way out of their problems, and sadly, the pain will not be confined to Japan. This will be the true test of the theories of neo-Keynesianism writ large. Japan is going to print and monetize and spend more than almost any observer can currently imagine. You like what Paul Krugman prescribes? You think he makes sense? You (we all!) are going to be participants in a real-world experiment on how that works out. For decades, people have been getting rid of cockroaches by setting out bait mixed with poison. But in the late 1980s, in an apartment test kitchen in Florida, something went very wrong. A killer product stopped working. Cockroach populations there kept rising. Mystified researchers tested and discarded theory after theory until they finally hit on the explanation: In a remarkably rapid display of evolution at work, many of the cockroaches had lost their sweet tooth, rejecting the corn syrup meant to attract them. In as little as five years, the sugar-rejecting trait had become so widespread that the bait had been rendered useless. "Cockroaches are highly adaptive, and they're doing pretty well in the arms race with us," said North Carolina State University entomologist Jules Silverman, discoverer of the glucose aversion in that Florida kitchen during a bait test. The findings illustrate the evolutionary prowess that has helped make cockroaches so hard to stamp out that it is jokingly suggested they could survive nuclear war. In a study published Thursday in the journal Science, Silverman and other researchers explain the workings of the genetic mutation that gave some roaches a competitive advantage that enabled them to survive and multiply. Currency speculators seem to be very much like your neighbor who makes frequent trips to Las Vegas. One soon learns that the correct inquiry of your neighbor upon his or her return is not 'How much did you win?' If they won, they tell you about it. If they lose, you might see a “For Sale” sign on the BMW in the driveway…and in extreme cases…a realtor's sign in front of the house, soon to be followed by a large moving van blocking your drive way. As we all know, everyone wins in Las Vegas…and it's the winning most people talk about. Unfortunately (or fortunately if you are a casino owner), everyone who gambles in Las Vegas also loses in Las Vegas…and the existence of all those marvelous edifices in the desert are ample proof that what's lost in Las Vegas stays in Las Vegas….and obviously your neighbor and other visitors lose more than they win. Most gamblers/speculators in either Las Vegas or in the currency markets who win big are more lucky than they are good in most instances. Granted the odds may be better if you are speculating on currencies in some manner…as you have the option to bet on governments to do something stupid…but that said, and to Stein's complexity point, there are enough times when governments do something smart when you are expecting them to do something stupid (or they can even do something less stupid than the other governments impacting the currency markets) that you can really get burned without even lighting the fire yourself. Big financial institutions do a lot of currency speculation. But with them, if they win, like your gambling next door neighbor, they tell everyone about it. If they lose, they don't talk about it…and if they lose a lot, unlike your gambling neighbor who just had to move, their own governments (We the People in other words), who they might well have even bet against, bail them out. Nice work if you can get it…and can still look yourself in the mirror in the morning. If one were to equate our philosophy on currency exposure to personalities in Las Vegas, we'd be the person who feels a hankering for an after-dinner drink and so throws a couple of coins in a nickel slot and stands around in the casino on the way back to their hotel room just long enough to get a couple of free drinks, the cost of which, had they been paid for, would have been much more than anything put in the slot machine. Better to get a few free drinks while losing a little money…with the possibility of winning a little on occasion, than getting a lot of free drinks that the big wagers get, while losing your spouse's car and maybe your house in the hopes you'll find out that you have become more lucky than good. Found via Jon Shayne. This is from Washington Irving’s The Crayon Papers, and there is a lot of investing wisdom packed into this single paragraph. It is from an introduction to the section he wrote on The Great Mississippi Bubble. When a man of business, therefore, hears on every side rumors of fortunes suddenly acquired; when he finds banks liberal, and brokers busy; when he sees adventurers flush of paper capital, and full of scheme and enterprise; when he perceives a greater disposition to buy than to sell; when trade overflows its accustomed channels and deluges the country; when he hears of new regions of commercial adventure; of distant marts and distant mines, swallowing merchandise and disgorging gold; when he finds joint-stock companies of all kinds forming; railroads, canals, and locomotive engines, springing up on every side; when idlers suddenly become men of business, and dash into the game of commerce as they would into the hazards of the faro table; when he beholds the streets glittering with new equipages, palaces conjured up by the magic of speculation; tradesmen flushed with sudden success, and vying with each other in ostentatious expense; in a word, when he hears the whole community joining in the theme of "unexampled prosperity," let him look upon the whole as a "weather-breeder," and prepare for the impending storm. I wrote last week about the many ways in which traditional long only fund managers are institutionally prevented from performing as well as they should – given their above-average intelligence and ample resources. But there was one thing I left out. It is that the majority of fund managers never hold cash as an asset class. They don’t consider it to be part of their job. It isn’t just individual funds that veer away from cash. The industry as a whole is also very keen to encourage us all to be fully invested at all times. It isn’t good for them for us to be sitting around with our money in savings accounts losing money to inflation, as opposed to being in investment funds and losing money on fees. Hence the regular press releases pointing out the difficulty of timing the market and the hideous long-term results of being out of the market on the two, four, five or perhaps 10 best days of the year. The propaganda works; almost all investors avoid holding cash. Ask anyone with a neat nestegg sitting in the bank how they feel about it and they’ll answer that they’re mildly guilty that it isn’t “working” for them. But the truth, I think, is that being able to sit in cash– without having to put up with snide remarks about being paid to do nothing – is yet one more factor that gives the intelligent private investor an edge over the intelligent institutional investor. The key to this is to think of cash as offering what economists like to call optionality. Sure, it hasn’t been a comfortable thing to hold over the last six months as markets have frothed and bubbled and inflation has eaten away at its purchasing power. But great fortunes don’t rest on holding what other people are holding at the top. They rest on being able to buy what other people can’t afford at the bottom. I spoke to James Montier of GMO at the London Value Investor Conference a few weeks ago and asked him how much cash he holds. The answer was that his own assets are in the GMO Global Asset Allocation Fund, one of the few that is comfortable holding cash and right now is awash with the stuff. I’m especially excited to announce my first web project. It’s called The Atlas of Public Stocks it is a searchable map of all publicly listed companies from around the world. In other words, you can use this map to locate public companies near a given address. Last year I was planning an investment trip to Munich, Germany and struggled to identify local public companies. I created this website to help investors facing similar situations. FAST COMPANY SPOKE TO FORMER JC PENNEY CEO RON JOHNSON THREE MONTHS INTO HIS NEW JOB. WHAT HE SAID THEN HELPS EXPLAIN WHY THINGS DIDN'T WORK OUT. Found via Abnormal Returns. The Warren Buffett quote that comes to mind: "We don't have to be smarter than the rest. We have to be more disciplined than the rest." More than just annoying, these messages are flat out wrong and in most cases counterproductive. They teach people to be impulsive and focus solely on the desired outcome while ignoring the path to get there. In study after study, it’s been shown that discipline and impulse control are the primary traits of successful people and the best predictor of future achievement. In contrast, unwarranted, overinflated self esteem is often a sign of future failure. Compared to discipline, even legitimate measures of intelligence have very little bearing as predictors of success. Great summary of how Apple’s tax set-up works. This an excerpt from the book Hedge Fund Market Wizards. The bold font is Jack Schwager’s remarks and the non-bold font is Jamie Mai’s comments. This isn’t exactly how it appeared in the book, as certain paragraph breaks and italics were omitted as I highlighted things in batches on my Kindle. I thought it was an interesting trade that is probably still relevant today if one wanted some cheap upside exposure to the market without having to risk too much capital, though you probably need a significant amount of capital under management in order to have access to this kind of trade. We have a trade on now that I really like. I don’t know if you read Jeremy Grantham of GMO. He is a widely respected value investor who looks across all asset classes and writes commentaries and editorials about what he is seeing. For some time now, he has been arguing that high-quality, consumer oriented franchises, particularly those that have great international brands, are cheap relative to the rest of the S&P based on both dividend yield and enterprise value to cash flow. In my view, he has laid out a fairly compelling argument that places relative valuations in the context of a cycle, wherein the low-quality names tend to outperform early in the cycle, and the high-quality names tend to outperform toward the end of the cycle. There is an index called the XLP, which is an index of U.S. consumer staple companies such as Procter & Gamble, Coca-Cola, and Johnson & Johnson. If Grantham is right, at some point we should see a revaluation of the stocks in this index. I assume that in the current cycle since the 2009 low, the XLP has gone up less than the S&P? It has gone up a lot less. Initially, we considered buying options on the XLP, which were relatively inexpensive. But Ben came up with a much better way to structure the same trade idea based on the XLP’s low beta of 0.5 versus the S&P500. One observation that we found particularly striking was that despite the XLP’s low beta, since the start of the index at the end of 1998, the net percentage changes in the XLP and the S&P over the entire period were almost identical. The XLP was up less in the bull markets and down less in the bear markets, but for the period as a whole, the net change was about the same. Seeing that both indexes had approximately the same net change over a long period—a period that included both the Internet boom and bust and the credit boom and bust—makes the notion that the XLP has a beta of 0.5 versus the S&P seem counterintuitive if applied to longer periods. In addition, we thought that cash flow and dividend valuations implied the potential for a 25 percent revaluation of the XLP versus the S&P. We went to an exotic option dealer and asked them to price an outperformance option that would be based on the performance of the XLP versus the S&P. What is the single measure that the dealer is going to use to price the odds that the XLP will outperform the S&P? Right. So with the beta equal to only 0.5, the model price for an outperformance option was very cheap. Translated into English, those inputs are saying that the XLP and S&P are likely to move in the same direction; however, the XLP will move only half as much as the S&P. But if we had a down market, then the lower beta would imply a higher probability of outperforming—namely, it would imply that the XLP would go down less than the S&P. That’s a great point, and it is the reason why, to get the option cheaply, we had to strike the option at the current spot price. So there was a dual condition for the option to pay off: The XLP had to outperform the S&P and the S&P had to be unchanged to higher. This was essentially a conditional long beta position. It was conditional on the XLP outperforming the S&P, and it was long beta because it could only pay off in an up market. What made you think the timing for the trade was right? We didn’t have any conviction that the market was going higher. We almost always want to have some long beta exposure, however, and by making the option conditional on the XLP outperforming the S&P, we were able to get beta exposure to the market extremely cheaply. When you own options, you’re always fighting against the time decay. Figuring out how to make the option premium cheaper is one way of mitigating that decay. So the basic premise is that beta is measured based on daily relative price changes, which can be a very poor indicator of long-term relative price changes. Right, a fact that is obvious if you look at a long-term chart comparison of the XLP versus the S&P. Volatility is a terrible proxy for measuring potential price change over longer intervals of time. For example, if an asset price changes by a constant percentage each day, its volatility will be zero. One of our strategies is called cheap sigma and is predicated on the idea that markets sometimes trend and that volatility will dramatically understate the potential price move of markets that trend. Kyle Bass hopes he is wrong, and so may everyone else, as the danger predicted by the founder of Dallas-based Hayman Capital is nothing less than a full blown financial crisis in the world’s third-largest economy, Japan. While the hedge-fund trade of the year has been to short the yen and buy Japanese stocks placed for an export boom, Mr Bass sees in “Abenomics” – stimulus from Japan’s new prime minister Shinzo Abe – signs of stress that he has been predicting for three years. The length of that call might see him labelled as just another bear pushing a tired case. Shorting Japanese bonds has been the “widow-maker” trade for a decade: as interest rates moved ever lower it destroyed investors betting on a rise. Thanks to Serge for passing this along. LIKE ANY POPULAR food writer, Gary Taubes gets more than his share of e-mails about his work. So he didn't give it much thought one day two years ago when he got a five-line comment about a podcast he'd given the week before. It was plainly signed "John." The man was intrigued by Taubes's theories on why people get fat—more specifically, the food writer's argument that most of the science on obesity is either badly flawed or inconclusive. What was needed, Taubes had said, was a comprehensive experiment that can answer some of the key questions about how our bodies process food. The problem is that such a study is hugely expensive. "From the little I know about the science of nutrition, your study makes a lot of sense," the listener wrote, adding that he ran a foundation focused on public policy. Taubes noticed that the full name in the email was John Arnold, and a quick Google search turned up a curious figure under that name: a wunderkind natural-gas trader at Enron who later founded his own hedge fund. The fund was secretive—little-known in its hometown, Houston, much less the rest of the country—but legendary in hedge-fund circles for its mega-returns. It was starting to get interesting. I predicted in Endgame that the latter half of this decade would see the most serious currency wars since the end of WWII. The opening shots have been fired. This will not be just a continuation of the currency skirmishes we have seen in recent decades. No, the real artillery is being brought to the front. And as in any war, it is best not to have your valuable personal possessions anywhere near the field of conflict. But which way to run? Who are the good guys to run to? Are there any good guys at all? Maybe the better question to ask is, who will win? Will there be any winners? Do you really want to look like Rocky Balboa after his first winning fight? This week we again focus on Japan. Their stock market has been on a tear, and their economy grew 3.5% last quarter. Is Abenomics really the answer to all their problems? Is it just a matter of turning the monetary dial a little higher and voila, there is growth? Why doesn’t everyone try that? And what would happen if they did? Even in the event that quantitative easing is sufficient to override hostile market conditions in the near-term, it is worth noting that long-term outcomes are likely to be unaffected. We presently estimate a prospective 10-year total return on the S&P 500 Index of just 2.9% annually (nominal). See Investment, Speculation, Valuation and Tinker Bell for the general methodology here, which has a correlation of nearly 90% with subsequent 10-year market returns – about twice the correlation and nearly four times the explanatory power as the “Fed Model” and naïve estimates of the “equity risk premium” based on forward operating earnings. We presently estimate that the S&P 500 is about 94% above the level that would be required to achieve historically normal market returns. If you work out present discounted values, you’ll find that depressed interest rates can explain only a fraction of this differential, even assuming another decade of QE – and even then only if historically inconsistent assumptions are made to combine normal economic growth with deeply depressed rates. Over the past three years, the U.S. economy has repeatedly approached levels that have historically marked the border between expansion and recession. There is little question that massive quantitative easing by the Federal Reserve has successfully nudged the economy away from this border for a few months at a time. But as I’ve noted before, the belief that monetary easing solved the 2008-2009 financial crisis is an artifact of timing. The Fed was easing monetary policy throughout 2008, and while it is tempting to view the recovery as a delayed effect, the more proximate factors were a) the change in FASB accounting rules to dispense with mark-to-market accounting, which relieved banks of insolvency concerns even if they were technically insolvent, and b) the move to government conservatorship and Treasury backstop of Fannie Mae and Freddie Mac, which reduced concerns about default risk among mortgage securities. The Pavlovian response of investors to monetary easing – as if it has anything more than a transitory and indirect effect on the economy – fails to distinguish between liquidity and solvency; between economic activity and market speculation; and between investment value and artificially depressed risk premiums. The economy is not gaining anything durable from these policies, and the conditions for the next bear market are already established. Meanwhile, the chart below updates the extreme that monetary policy has already reached (data points since 1929). The 3-month Treasury yield now stands at a single basis point. Unwinding this abomination to restore even 2% Treasury bill rates implies a return to less than 10 cents of monetary base per dollar of nominal GDP. To do this without a balance sheet reduction would require 12 years of 6% nominal growth (which is fairly incompatible with sub-2% yields), a more extended limbo of stagnant economic growth like Japan, or significant inflation pressures – most likely in the back half of this decade. The alternative is to conduct the largest monetary tightening in the history of the world. Found via Broyhill Asset Management (the Broyhill post also includes some great comments and Klarman letter excerpts). Former Fed Chairman Paul Volcker warned of the risks of an asset bubble forming given the incredible amount of liquidity the Bernanke Fed has injected into the market, even though he said banks are substantially stronger than before the crisis on Wednesday. Volcker also indicated that in the U.S. government makes up about 35% of GDP and that the financing of the residential mortgage market by the state has led to a dysfunctional financial system. "Time for the education system to realize that slow learners are deeper, more robust, and unlike fast ones, make small, rather than large mistakes." Anointed the next Steve Jobs by some admirers, Twitter inventor and Square CEO Jack Dorsey is one of the few people who can get the Silicon Valley press corps to roll out of bed early to hear what he has to say. Unlike Jobs, Dorsey spoke from a table at Blue Bottle Coffee near Square’s San Francisco headquarters, not the stage of the convention center down the street. Also unlike Jobs, he didn’t announce a product that at first glance seemed ready to detonate our digital lives and rearrange the pieces in a fundamentally new way. Instead, Dorsey unveiled a cash register stand. Which, as banal as that sounds, turns out to be kind of a big deal. Certainly it’s the most elegant cash register stand ever made (though I’m also partial to the wooden, Dorsey-commissioned IntraStand). The Square Stand cradles an iPad running Square’s register app. A credit card reader is built into the base. The stand can also connect to a receipt printer and a cash drawer. Based on appearances and apparent usability, it’s the coolest cash register available. And at $299 off the shelf, it’s a seemingly dead-simple, far cheaper out-of-the-box way for a small business to start taking payments—just add internet. More importantly, the Square Stand reflects Dorsey’s fixation on reinventing technologies most of us consider mundane. In Dorsey’s Apple-esque design philosophy, the best technology is technology that gets out of the way, that becomes so commonplace that it drops beneath our notice–think electrical sockets and traffic lights. The more transparently usable a technology is, the more it disappears into its use rather than taking up space as an object of attention itself – the better the design. Our appreciation of the importance of selecting a “good industry” must be tempered by a realization that this is by no means so easy as it sounds. Somewhat the same difficulty is met with in endeavoring to select an unusually capable management. Objective tests of managerial ability are few and far from scientific. In most cases the investor must rely upon a reputation which may or may not be deserved. The most convincing proof of capable management lies in a superior comparative record over a period of time. But this brings us back to the quantitative data. There is a strong tendency in the stock market to value the management factor twice in its calculations. Stock prices reflect the large earnings which the good management has produced, plus a substantial increment for “good management” considered separately. This amounts to “counting the same trick twice,” and it proves a frequent cause of overvaluation. Found via RDFRS. The scientific discovery made by Dr. Shimomura is a reminder of the kind of happy accident or serendipity that is often the source of major breakthroughs. LOS ALAMOS, N.M. — Sixty-eight years ago, Osamu Shimomura was a 16-year-old high school student working in a factory seven and a half miles from Nagasaki, Japan. Sitting down to work, a light flashed, briefly blinding him, and the pressure wave from an explosion came rolling through. His future wife, Akemi, was not as lucky. She was just over a mile from the blast and, though sheltered by a small hill, suffered for years from the effects of radiation poisoning. In the aftermath of World War II and the dropping of the atomic bomb on Hiroshima and Nagasaki, Dr. Shimomura, now a Nobel Prize-winning chemist, said he largely put the events out of his mind. But here he was last month, in the birthplace of the atomic era, to deliver a lecture at the monthly Director’s Symposium. Nearby was a museum with Manhattan Project artifacts, and surrounding him were Los Alamos scientists who were curious about how this man, now 84 and a professor emeritus at the Marine Biological Laboratory in Woods Hole, Mass., felt about the bombings in 1945. That is not, though, what he chose to address in his talk to about 100 Los Alamos scientists and lab workers. Thanks to David for passing the transcript of the video along as well. Found via Broyhill Asset Management. From yesterday. Found via ValueWalk. "Experience keeps a dear school, but fools will learn in no other and scarce at that; for it is true, we may give advice, but we cannot give conduct." Via Market Folly. 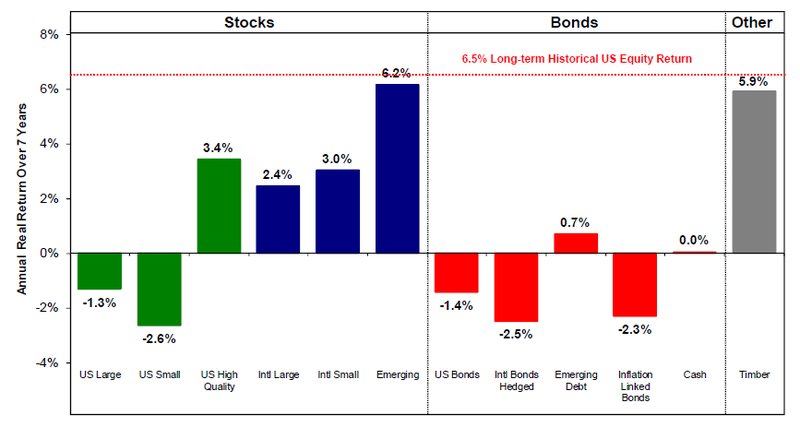 This was interesting: "James Montier said that GMO’s 7 year asset allocation model for US stocks is now predicting negative returns. GMO are now 50% in cash." It is graduation time, and this morning finds me swimming in a sea of fresh young faces as a young friend graduates, along with a thousand classmates. But to what? I concluded my final formal education efforts in late 1974, in the midst of a stagflationary recession, so it was not the best of times to be looking for work. It turned out that I had a far different future ahead of me than I envisioned then. But I would trade places with any of those kids who graduated today, as my vision of the next 40 years is actually very optimistic. With all the advances in healthcare, technology, and communications that have come and will come, they will get to embrace a world full of opportunity; and yet, this generation is starting out with more than just a minor economic handicap. And a quick note up front on Japan. As of the last two weeks, Japanese investors are now net buyers of foreign bonds, and the yen has broken through 100 to the dollar. I think what is happening in Japan is going to be the nexus of a global flow of cash that will be unlike any we have ever seen. Attention MUST be paid. It is windshield time. Also, be sure to watch the extra segment on Bill Gates and Steve Jobs, HERE. In these days of frivolous entertainments and frayed attention spans, the people who become famous are not necessarily the brightest stars. One of the biggest hits on YouTube, after all, is a video of a French bulldog who can’t roll over. But in amongst all the skateboarding cats and laughing babies, a new animated video, featuring the words of a dead theoretical physicist, has gone viral. In the film, created from an original documentary made for the BBC back in the early Eighties, the late Nobel Prize-winning professor, Richard Feynman, can be heard extolling the wonders of science contained within a simple flower. There is “beauty”, he says, not only in the flower’s appearance but also in an appreciation of its inner workings, and how it has evolved the right colours to attract insects to pollinate it. Those observations, he continues, raise further questions about the insects themselves and their perception of the world. “The science,” he concludes, “only adds to the excitement and mystery and awe of the flower.” This interview was first recorded by the BBC producer Christopher Sykes, back in 1981 for an episode of Horizon called “The Pleasure of Finding Things Out”. When it was broadcast the following year the programme was a surprise hit, with the audience beguiled by the silver-haired professor chatting to them about his life and his philosophy of science. Now, thanks to the web, Richard Feynman’s unique talents – not just as a brilliant physicist, but as an inspiring communicator – are being rediscovered by a whole new audience. As well as the flower video, which, to date, has been watched nearly a quarter of a million times, YouTube is full of other clips paying homage to Feynman’s ground-breaking theories, pithy quips and eventful personal life. I’ve often noted that even a run-of-the-mill bear market decline wipes out more than half of the preceding bull market advance. I doubt that the present instance will be different. Indeed, cyclical bear market declines that occur in the context of secular bear markets average a market loss of about 39%, wiping out about 80% of the prior bull market advance. We presently estimate a nominal total return for the S&P 500 of just 3.2% annually over the coming decade. It is not pessimism, but optimism – and optimism born of a century of evidence – that we expect stocks to provide more favorable opportunities for investment over the completion of this cycle. It is that carefully-studied optimism that leads us to reject the notion that investors are forced to crawl to the ground and “lock in” low prospective long-term returns, while ignoring severe intermediate-term risks to capital. I’ll note in passing that the Shiller P/E reached 24 last week (S&P 500 divided by the 10-year average of inflation-adjusted earnings). Secular bear market lows have typically taken the Shiller P/E below 8 before durable secular bull market advances have taken hold. Valuations are a long way off from that, though I would expect at least one or two more complete bull-bear cycles to emerge before the market achieves valuations that would support a durable secular uptrend. There will be plenty of significant opportunities to periodically accept market exposure even if a secular bull market is nowhere in sight. The perception that investors are “forced” to hold stocks is driven by a growing inattention to risk. But Investors are not simply choosing between a 3.2% prospective 10-year return in stocks versus a zero return on cash. They are also choosing between an exposure to 30-50% interim losses in stocks versus an exposure to zero loss in cash. They aren’t focused on the “risk” aspect of the tradeoff, because they believe that they will somehow be able to exit stocks before the tens of millions of other investors who hold identical expectations.